What Is the Best Color for Office Walls? 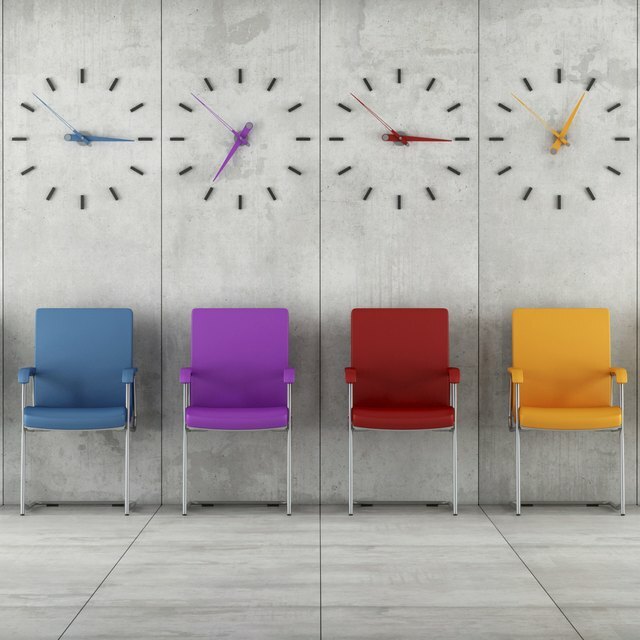 How Do Colors in the Workplace Affect Employees' Moods & Attitudes? White can make an office too sterile, while black can scare your customers away. Neither of these are usually the best color for office walls. No matter what line of work you are in, the color of your walls can help stimulate workers, relax customers and create an inviting space. Whether you work in a small, large or home office, you should choose the office wall colors to help your business succeed. Consider carefully the mood you want to set in the office. Colors in our environment can have both an emotional and physiological response. Seeing vibrant red and violet wall colors actually stimulates adrenaline production in the body, increasing your energy and creativity levels. Pale blues have a calming effect, while yellows and greens make office inhabitants more cheerful. Black can set a tone of power and dominance. Intensity of colors and color combinations also have their own effects. While pale blue shades can create a soothing environment, bright blues are as stimulating as reds and violets. No matter what the individual color elicits, contrasting office space colors can be jarring and agitating to visitors. Try using analogous colors on the color wheel to create a harmonious environment. This mimics the complementary shades found in nature. The best color for office walls often depends on its function. A doctor's office requires soothing colors to help calm nervous patients. Stimulate cubicle workers with bright reds, violets, and blues. Consider soft shades of yellow for a child psychologist's office, to help the children feel both relaxed and positive. What Is the Meaning of Office Layout? Look for deeper colors to help mask dirt and fingerprints in offices with a lot of traffic, particularly from attached warehouses, garages, or labs. Medical offices and food distributors should work with lighter colors to show a clean and fresh environment to customers. Because you will be spending a lot of time there, your personal taste should have a role in selecting the best color for office walls. A bright red wall may stimulate work for some, and irritate others. Consider slightly different shades that will work for you – a deep burnt orange can also stimulate creativity, but creates a warmer space than a bright red. If pale blue is too cold or boring, try a sage green or light aqua to create a soothing but more interesting space. For offices with multiple workers, poll the staff for their own preferences. If the majority of your staff hates the new color, they'll be less productive and may even be more likely to leave. Work with your existing furniture and carpeting. Yellow walls may be cheerful, but they will clash terribly with mauve furniture. Pale birch desks can be livened up with deep red and orange office wall colors. Sleek black furniture can complete a modern office with cool blues or vibrant reds. Hold color swatches up to each element in the office to make sure it works with both the furniture, carpeting, and trim. Small offices can work with both light and dark colors, though too dark a shade can make the space too cave-like. Vibrant colors may be too much of a good thing in a large space; consider only doing one or two accent walls and balancing it with a more neutral shade. Pale pastels in a large office can wash the space out; try two walls of pale sage with two walls of pale green to add interest. Valerie David has been a professional writer for over a decade, composing articles for TVOvermind.com, TheFrisky.com, IMDB, TVNow.com and her own TV news blog. She has also been published in fiction, with short romantic stories and a manga comic script. David holds a Bachelor of Arts in English, with extensive background as a research librarian.